According to the Spanish Law 15/1999, of 13th September, regarding protection of personal data and other legal regulations in force, all the personal data provided by the user will be and stored in a private computerized file provided that a contracted relationship exists, otherwise all the data will be eliminated. This file is for the sole purpose described in the information application form. All personal data will be processed according to protection requirements stated in the Spanish Royal Decree 994/1999, of 11th of June and other legal regulations in force. Appropriate measures will be taken in order to prevent personal data from alteration, loss, misuse or unauthorized access by third parties. The user can exercise his rights to oppose, access, correct and/or cancel its personal data, according to terms and conditions stated in the legal regulations in force, through written communication to A.M.L. / Idoia Herran – Paseo Maritimo 38, 07014 Palma de Mallorca, SPAIN. 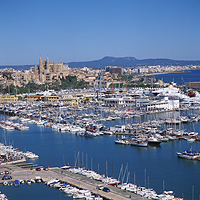 If you have any questions or comments, you can contact us by e-mail to info -at- aml-mallorca -dot- com.